Ancient Tindaris is located on high ground overlooking the Tyrrhenian coast about 60 kilometers west of Messina. Like Morgantina, Tindaris was settled during the Bronze Age (circa 1500 BC). The Syracusan Greeks refounded it in 396 BC, and in 254 BC it became a Roman city. Tindaris supported Pompey in his war against Octavian, and was conquered by Agrippa in 36 BC. Augustus made it a colony. The town suffered the effects of a landslide at the end of the 1st century AD, and an earthquake in 365 AD.Tindaris was the most important Greek city in this vicinity, though most of what the visitor sees today was constructed during the Roman era. Following the fall of the Empire and the arrival of Christianity, its importance continued, and in the 6th century it became diocesan see; the Sanctuary of the Black Madonna is Tindari's main religious attraction. The Saracens destroyed the city in 836. Tindari's amphitheatre was built in the 4th century BC. It has the ruins of simple temples and the so-called basilica, a fine example of Greco-Roman architecture begun in the 4th century BC and successively modified for use as a meeting place. There were also baths at Tindari, and some splendid dwellings. Finds from the site are housed in the Antiquarium. Closer to Palermo (about 160 kilometers from Messina), the ancient settlement of Halaesa is located near Tusa. Halaesa was probably founded by Arconides around 403 BC, after the truce with Syracuse. The city sided with Rome during the First Punic War, and consequently was exempted from Imperial taxes (tribute). The town was commercially prosperous but under the corrupt Verres its wealth declined. 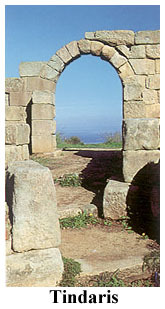 Sicily is dotted with the vestiges of settlements like Halaesa, most of which are too small to justify a special visit. Though very little of Halaesa remains, it is worth seeing if you're in the area. There are a number of restaurants in the town center and near the beach that offer seafood and other local cuisine.